Today I saw what in my mind will be the Best Picture of 2009. District 9 is like no other film I have ever seen. Written and directed by newbie director Neill Blomkamp, this movie has a small budget, limited shooting locale and a completely no-name cast but pulls off cinematic brilliance in telling the docu-drama story of a social clash between humans and aliens. Peter Jackson (guru of the Lord of the Rings trilogy) adds his producing touch by bringing on-board the best effects team in the business. All of the ingredients add up to an astonishing and riveting movie that instantly cracks my personal list of the top 10 movies of all-time. The plot of District 9 which powers the tremendous visual effects sequences is simple in scope but features several well-scripted twists. At the beginning of the movie, we find out that a mothership full of a million aliens came and parked over Johannesburg, South Africa over 20 years ago. 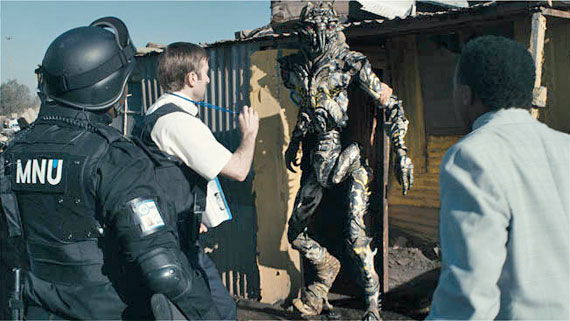 The bulk of the film deals with the plight of a large multi-national corporation (MNU) and their efforts to move a large amount of refugee aliens (dubbed as prawns due to their shrimp-like appearance) from their current sectioned-off area near the city (District 9) to a new isolated location over a hundred miles outside of the metropolitan vicinity. We see visuals and tones reminiscent of the era of apartheid that plagued South Africa for decades. There are so many interesting twists throughout the story that continue to add new layers of intricacy. To not spoil things for anyone I won't get into the details. If anyone would like to discuss the film after seeing it, I can get more into the specifics of what I loved about the plot of the movie. District 9 thrusts forward two major stars as the result of this masterpiece, Sharlto Copley and Weta Digital. Copley, in his debut acting role, plays the central character of Wikus Van De Merwe, the lead organizer from MNU in charge of commanding the mission to evict all prawns from District 9. We see Wikus early in the film as a desk jockey and follow his progression through physical suffering out in District 9 to pure rage and revenge as he develops keen survival skills. Copley is amazing in this role and is totally believable from start to finish. He really nails the scenes of bewilderment and agony as he experiences one extreme situation after another. Copley gives a raw performance that is unheard of in a first-time actor. If he is not nominated as Best Actor for this role I will be shocked (and appalled). With all due respect to Industrial Light and Magic, Weta Digital is leading the visual effects charge in Hollywood. We already saw their magic in the LOTR trilogy and they raise the bar even further with District 9. Building on the success of creating the first truly pivotal digital character in Gollum, Weta builds a race of intricate aliens that the audience can truly emphasize with. Unlike the work of ILM in the last three Star Wars films, the prawns in District 9 are not put on screen just for eye candy purposes but as integral plot pieces that pull the viewer into the story. Towards the last third of the movie you forget that these creatures were created on a computer and really believe in their existance. The alien weaponry and spacecraft effects are equally as amazing. In the sound department, you can totally feel every explosion and gunshot. The vocalization work of the prawns is also well done and adds to the overall realism. I can only imagine what Weta will do to up the ante with the upcoming Hobbit films. I would like to raise my rating system to give District 9 a rating higher than 5 JR's, but I have to stick to my guns. As perfect as a Sci-Fi film can be, I will tell you that if this film is overlooked for a Best Picture nomination (especially in a 10-film nomination year), I guarantee I will stop watching the Oscars for the rest of my life. District 9 grabs you from the opening scenes and you really never have time to relax throughout the remainder of the movie. It really is incredible what a talented group of filmmakers can do with a $30 million budget. I'm sure at least half of that sum went to the technology wizards at Weta Digital. Money WELL spent. Like you, I thoroughly enjoyed this movie. I thought one of the unappreciated aspects of the special effects was that they were well integrated into the film. Most of the spaceship/robot/gun scenes didn't have the usual "CGI" feel to them, although some of the prawns occasionally suffered from the traditional lighting problems that affect CGI characters. I also appreciated the subtle humor brought to the movie (even some of the fight scenes, where soldiers are getting literally exploded by alien weaponry, seem to be intentionally comedic). I will say, though, that as much as I enjoyed this movie there are two things working against its oscar chances: Wikus Van De Merwe is too much like Murray from Flight of the Conchordes to be a truly believable character (even though this worked perfectly for the film) and Hurt Locker was simply a better movie. Go see it if you haven't already. I definitely need to see The Hurt Locker. I hear great things about that movie. I've never seen Flight of the Conchordes so I can't relate Wikus to that character. I doubt the Academy will let that show affect their voting decisions though.